One of the most memorable postseason runs in recent history gave the Los Angeles Kings their second Stanley Cup championship in three seasons. After playing three consecutive seven-game series to reach the NHL finals, the Kings dispatched the New York Rangers in five games for the title. General Manager Dean Lombardi has built an impressive core of talent, one that should contend for the next several years. In the era of the NHL salary cap, the Kings will still have some roster decisions to make in the offseason. Their overall depth and stable of young players should offset any major veteran losses. Bring Back Gaborik: The Kings Trade deadline acquisition of Marian Gaborik from the Columbus Blue Jackets turned out to be a masterstroke, especially in the first and second rounds of the playoffs. The dynamic forward scored several big postseason goals, forming a winning combination with Anze Kopitar. Gaborik led the NHL in postseason goals with fourteen, winning his first Stanley Cup in the process. He’ll be a coveted free agent but all signs indicate that the Kings have the interest and ability to re-sign the Slovakian forward. This postseason the Kings became a much more dynamic offensive team, and Gaborik’s presence was a big factor in that evolution. Sign either Willie Mitchell or Matt Greene: Lombardi has done a fantastic job locking up the core of the roster in long-term deals. Drew Doughty and Alec Martinez, the team’s top defensive combo, are signed through next season. Two veteran blue-liners, Willie Mitchell and Matt Greene are unrestricted free agents. Both have battled injuries the past couple of seasons, but are key contributors when healthy, as well as a veteran presence. Mitchell, in particular, played a massive role this postseason. The Kings don’t need to resign both veterans but should look to bring one of them back for the veteran presence and overall depth of the defense. Continue the youth movement: In the new NHL salary cap era, it’s incredible how adeptly Dean Lombardi has built the roster and managed the salary cap. Core players Dustin Brown, Jonathan Quick, Drew Doughty, Jeff Carter, Slava Voynov and Mike Richards are all signed for the next five seasons while Anze Kopitar, Alec Martinez, and Jarett Stoll are all signed through at least next season. The long-term deals have given the King’s stability while their young players have developed. This past postseason the LA Kings received massive contributions from the exciting young talent of Tyler Toffoli, Tanner Pearson, and Kyle Clifford. All three played big roles and should play even bigger roles next season. The offensive spark provided by the three, along with Gaborik, played a role in the King’s offensive evolution from a defensive and puck possession team to the highest scoring team in the past postseason. Along with the Chicago Blackhawks, the Kings will be the favorites to represent the Western Conference in the NHL finals next season. They are a potential dynasty, a franchise built for the long haul. The key now is health and the continued evolution of the young talent the organization has built. In the last twenty seasons, dynasties in the NHL have been few and far between. In an era of competitive balance created by the salary cap, the Kings have a real opportunity to win consecutive Stanley Cup titles. Find out how much LA Kings ticket prices are for their upcoming games at the Los Angeles Staples Center. Two years after winning their first Stanley Cup in forty-five years as a franchise, the Los Angeles Kings won their second title in three seasons, defeating the New York Rangers in double overtime, 3-2. Alec Martinez, who scored the winning overtime goal in game seven of the Western Conference Finals, beat Rangers goaltender Henrik Lundqvist to give the Kings another title. Martinez’s goal, at 14:43 of the second overtime, came off of a rebound of a Tyler Toffoli shot. Toffoli’s shot was blocked by the Rangers goaltender, but the veteran Lundqvist gave up an easy rebound and Martinez slotted it into the empty net, setting off a raucous celebration at STAPLES Center. Like they had so many times in the series the Kings fought back from a deficit to win the game in overtime, their third overtime victory of the series. Justin Williams opened the Kings scoring in the first period, but the Rangers fought back in the second period with a pair of goals, from Chris Kreider and Brian Boyle, to take the lead into the third period. With twelve minutes left in regulation, Marian Gaborik notched his fourteenth goal of the playoffs to tie the game at two and set up the eventual overtime period. Gaborik’s goal, on a power play, was assisted by Jeff Carter and Drew Doughty. The victory over the Rangers was the Kings twenty-sixth playoff game, an NHL record for most games played in single playoffs. Before dispatching the Rangers in five games, the Kings went to seven games in their previous three series, versus San Jose, Anaheim, and Chicago. The Kings have played sixty-four playoff games in the past three seasons, another NHL record. The third overtime victory, which followed an overtime win in game seven of the Western Conference Finals, proved once again that the Kings mettle in deciding games. 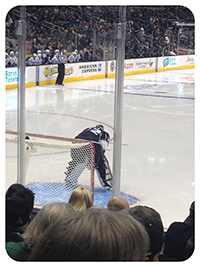 Unlike the previous three, the finals didn’t go seven games, but the Kings and Jonathan Quick stood tall again. Quick, who went through some stretches of poor play in this year’s playoffs, was superb once again with the game on the line. Quick made 28 saves including several clutch stops in the third period and overtime. The Kings star goalie may have had some rough moments earlier in the finals, but he was perfect in all three overtimes, including a shutout in game three. The Kings title was a complete team effort, with the Conn Smythe Award as playoff MVP going to Kings forward Justin Williams who scored several clutch goals in the postseason, including the opener in game five, his ninth of the postseason. Williams finished with 7 points and five goals in the finals, and 26 total points in the playoffs. Williams joins Jonathan Quick has a Los Angeles Kings Conn Smythe Award winner. Williams narrowly edged out defenseman Drew Doughty, who played forty-one minutes in the final game. Doughty and center Jeff Carter joined a small group of players who won both an Olympic Gold Medal and Stanley Cup championship in the same season. Do you know how many Stanley Cups the Los Angeles Kings have won since their first season? After another dominating victory the Los Angeles Kings are now on the brink of another visit to the Stanley Cup Finals, their second in three seasons. Behind a three-goal first period barrage, the Kings jumped on top of the Chicago Blackhawks early and never looked back, winning 5-2. For nearly two seasons the Blackhawks, and goalie Corey Crawford, had the Kings number defensively. In three straight impressive victories, the Kings have turned it all around, scoring fifteen goals in the past three games for a commanding lead. With the series returning to Chicago for a game five, the Kings will now have three opportunities to eliminate Chicago. Monday’s win was another impressive display of both offensive and defensive hockey. The Kings, known for their defense, have become the top scoring team in the playoffs, while still playing efficient and effective defense behind a veteran unit of blue-liners and goaltender Jonathan Quick. Jake Muzzin, Marian Gaborik, and Dustin Brown all scored in a six-minute stretch of the first period, giving Los Angeles a 3-0 lead and eventual victory. Drew Doughty and Tanner Pearson would also add a score in the second and third periods as the Kings preserved their three goal lead. After largely getting the balance of their offense from the Kopitar and Gaborik line in the opening round against the San Jose Sharks, the Kings have become a balanced offensive juggernaut versus Chicago, with offense coming from nearly every line and the defense. Los Angeles now has eight players with double figures in points this postseason. Goaltender Jonathan Quick made 22 saves in the victory. The Kings offensive barrage is particularly surprising since they were the lowest scoring team to make the postseason. After trailing 2-0 late in game two in Chicago, the Kings have scored 13 goals in just over 100 minutes of hockey, a dominating performance that has the Chicago Blackhawks looking for answers. In accomplishing this offensive outburst the Kings now may have the mental edge on Crawford, a player who’s consistently stymied them in recent seasons. Crawford stopped just sixteen shots in the loss. The Blackhawks will now have to fight their way back from a 3-1 deficit, something they accomplished last season versus the Detroit Red Wings. Coming from behind two games will be a tall task versus a confident Kings team. Last year’s Blackhawks and Red Wings matchup was an opening round one versus eight affairs, not a Western Conference Finals. In order to beat the Kings, the Blackhawks will need to find some confidence on defense, something that has seemingly evaporated as they’ve been outscored 15-7 over the last three games. Chicago will also need offense from Patrick Kane, who’s managed just one point in the series. Kane’s struggles have been mirrored by Bryan Bickell, a hero in last year’s postseason who had a sub-standard regular season and has struggled this series, with only a goal on Monday night. Game five is Wednesday night in Chicago at the United Center. Kings and Blackhawks on Collision Course? Combined the Chicago Blackhawks and Los Angeles Kings have won three of the last four Stanley Cups. After they both started slow in the opening round of this year’s playoffs, the Blackhawks and Kings have now won a combined 11 straight playoff games. Chicago holds a 2-0 lead on the Minnesota Wild, winning the first two games by a combined 9-3 score. Los Angeles has their hands full versus the top seeded Anaheim Ducks, but after an exciting come from behind victory in the opening game the Kings now have home ice advantage. Both teams are peaking at the right time. Are they on a collision course for the Western Conference finals? From a Blackhawks standpoint the inevitable answer is yes. Chicago should have no difficulty dispatching the Wild and likely getting several days of rest in the process. Minnesota has a talented core group, but they are severely overmatched at the most important position in professional sports, goaltender. With Corey Crawford in net the Hawks have a massive advantage over Minnesota and Ilya Bryzgalov. After playing without captain Jonathon Toews and Patrick Kane at the end of the regular season the Blackhawks are healthy again. The Los Angeles Kings road to the Western Conference finals won’t be that easy. The Anaheim Ducks have two elite players in Hart Trophy Candidate Ryan Getzlaf and former Hart Trophy winner Corey Perry. Anaheim has a deep and talented deep with an ideal combination of youth and experience. Los Angeles came back to win game one at the Honda Center, but the Ducks and Kings series has the feel of a classic NHL postseason matchup, one destined to go seven games. The fact that the two teams are just thirty miles apart adds an extra element to the intensity of the series. Monday’s game is an absolute must-win for the Ducks, who simply cannot afford to fall behind 2-0 versus a team with a goaltender as talented as Jonathan Quick. If the Kings do advance, and provided Minnesota doesn’t pull a comeback, the Kings and Blackhawks will meet in the Western Conference finals once again. Last season the defending Stanley Cup champion Kings lost a five game series to Chicago, who would go on to beat Boston to win their second cup in four seasons. The Kings offense went stagnant in last year’s matchup, scoring just eleven goals in the five game series. The Kings have bolstered their offense this season, through the evolution of some young players as well as the big acquisition of Marian Gaborik. So who wins? Chicago is playing their best hockey of the season, with a healthy roster and outstanding goaltender play from Corey Crawford. The Kings, after a brutal start to the San Jose series, have been tremendous over the last week and a half. If the two teams do meet the series will come down to the inevitable defense and goaltending, as well as the Kings ability to slow and contain Patrick Kane. The evolution of Drew Doughty has given the Kings offense a new element, as has the acquisition of a healthy Marian Gaborik. The two goals Gaborik scored to win game one versus the Ducks is a prime example of what the former Wild and Rangers superstar gives the Kings that they didn’t have when they met the Blackhawks last season. This year’s Blackhawks team hasn’t been as nearly impressive as last year’s. Chicago has dominated Minnesota on the scoreboard, but the actual games have been much tighter. Sunday’s game was very similar to Friday’s, where Chicago went through long stretches of unimpressive play. In a tight series the team with the best goaltender arguably has the advantage, and Los Angeles has the best goaltender. 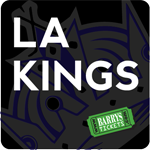 Barry’s Ticket Service has been selling Kings Tickets since 1985! 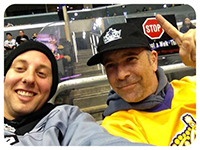 All LA Kings Tickets come with our 100% guarantee to be authentic and delivered to you on time.